One day I was going to the fields, accompanied by my faithful dog, guardian of our farms and sworn enemy of those monkeys who devastate them. It was the time of the great heat of April. My dog and I were so hot that it was only with great pain that we were able to breathe properly. I had no doubt that in the end one of us, perhaps myself, would faint. Thanks to God we came upon a thicket of clustered branches with a thick covering of green leaves. My dog, whimpering slightly, raced towards the shadow. But when he reached it, he did not stay there, but returned to me, his tongue hanging out, his lips sagging, his pointed white teeth, bared. His sides throbbed rapidly making me realise how exhausted he was. I moved towards the shade and the dog became happier. But I decided to continue on my way. He whined plaintively, but nonetheless followed me, his head more bowed, his tail curled between his legs. He was visibly in despair, but decided to follow me whatever the consequences. This faithfulness touched me deeply. I did not know how to appreciate the act of this animal, ready to follow me to the death without any need of his own, and without being constrained to do it by anything whatever. He was loyal just because he considered me his master. He proved his attachment to me by risking his life with the sole aim of following me and being at my side. Some people wish that their enemies become ugly. But when people are angry, even if they are well bathed, beautifully dressed, and their hair neatly cut, they become ugly themselves! This is exactly what their enemies would wish for them! Some people wish that their enemies sleep poorly. But when people are angry, even if they sleep on luxurious beds, with white sheets, fluffy pillows, and beautiful blankets, they will sleep poorly because of their anger. This, too, is exactly what their enemies would wish! Some wish that their enemies not profit in business. But when people are angry, they become confused: When they suffer a loss, they think they are making a profit; when they make a profit, they think they are suffering a loss. This leads to constant worry, which is exactly what is enemy would wish! Some wish that their enemies not have any wealth. But when people are angry, even if they start out with wealth that they have worked hard to accumulate, they will behave badly and may wind up in jail or paying fines for their misbehavior, and eventually lose their fortunes. This is exactly what his enemy would wish! Some wish that ther enemies lose their reputation. But when people are angry, whatever reputation they have, and however well earned it may be, will disappear, which is exactly what their enemies would wish! Some wish that their enemies have no friends. But when people are angry, their friends and relatives avoid them because of their temper. This is exactly what their enemies would wish! And finally, some people wish that their enemies would go to hell. But when people are angy, they commit all kinds of sins, in their behavior, their speech, and in their minds. When they die, they may find themselves in hell, which is exacly what their enemies would wish! These are the seven things which happen to angry people, which end up making their enemies happy. Once the Blessed One was staying among the Bhaggas in the Deer Park at Bhesakala Grove, near Crocodile Haunt. Then early in the morning the Blessed One put on his robes and, carrying his bowl and outer robe, went to the home of the householder, Nakula's father. On arrival, he sat down on a seat made ready. Then Nakula's father & Nakula's mother went to the Blessed One and, on arrival, having bowed down to him, sat to one side. As they were sitting there, Nakula's father said to the Blessed One: "Lord, ever since Nakula's mother as a young girl was brought to me [to be my wife] when I was just a young boy, I am not conscious of being unfaithful to her even in mind, much less in body. We want to see one another not only in the present life but also in the life to come." And Nakula's mother said to the Blessed One: "Lord, ever since I as a young girl was brought to Nakula's father [to be his wife] when he was just a young boy, I am not conscious of being unfaithful to him even in mind, much less in body. We want to see one another not only in the present life but also in the life to come." [The Blessed One said:] "If both husband & wife want to see one another not only in the present life but also in the life to come, they should be in tune [with each other] in conviction, in tune in virtue, in tune in generosity, and in tune in discernment. Then they will see one another not only in the present life but also in the life to come." Dhul-Nun al-Misri the Egyptian told the following story of his conversion. I was informed that in a certain place an ascetic was living. I set forth to visit him, and found him suspending himself from a tree. A fit of weeping overcame me. The devotee heard me crying. I approached him and gave him greeting. â€œWhat is this state of affairs?â€� I asked. I supposed that he must have shed a Muslimâ€™s blood, or committed some other deadly sin. â€œWhat a tremendous ascetic you are!â€� I cried. I proceeded thither, and saw a young man squatting in a hermitage; one foot had been amputated and flung out of the cell, and the worms were devouring it. I approached him and saluted him, then I enquired after his circumstances. The mountain was too high for me to reach the top, so I enquired about this man. The things I had seen and the words I had heard caused a mighty pain to clutch my heart. I realized that whoever puts his trust in God, God cares for him and suffers not his anguish to be in vain. As I went on my way, I saw a blind little bird perched in a tree. It fluttered down from the tree. â€œWhere will this helpless creature get food and water?â€� I cried. The bird dug the earth with its beak and two saucers appeared, one of gold containing grain and the other of silver full of rosewater. The bird ate its fill, then it flew up into the tree and the saucers vanished. Utterly dumbfounded, Dhul-Nun al-Misri thenceforward put his trust in God completely, and was truly converted. He pushed on several stages, and when night fell he came to a desert. In that desert he sighted a jar of gold and jewels, and on the top of the jar a tablet on which was written the name of God. His companions divided the gold and the jewels between them. â€œGive me the tablet on which is written the name of my Friend,â€� Dhul-Nun al-Misri cried. Dhul-Nun al-Misri then returned to the city. His story continues. â€œWhy do you say that?â€� I demanded. So saying, she vanished. I then realized that she was not a mortal creature, but had been sent as a warning. A fire invaded my soul, and I flung myself in the direction of the sea. lost on board. One by one the passengers were taken and searched. Finally they reached the unanimous conclusion that the jewel was on me. They set about belabouring me and treated me with great disrespect, whilst I remained silent. At last I could endure no more. â€œO Creator, Thou knowest,â€� I cried. Thousands of fishes thereupon put their heads out of the water, each with a jewel in its mouth. Dhul-Nun al-Misri took one of the jewels and gave it to the merchant. All on board when they saw this fell at his feet and begged his pardon. So highly was he considered in the eyes of men. That was why he was called Dhul-Nun al-Misri (â€œThe Man of the Fishâ€�). â€œHow is that?â€� he was asked. â€œWhen I reached the caliphâ€™s palace,â€� he replied, â€œand beheld that court in all its magnificence, with the chamberlains and attendants thronging its passages, I wished that some change might take place in my appearance. A woman with a stick in her hand came up and, looking straight at me, addressed me. â€œThen on the road I saw a water-carrier. He gave me a draught of pure water. I made a sign to one who was with me to give the man a dinar. He refused to take it. After that it was ordered that he should be put in prison. Forty days and nights he remained in gaol, and every day the sister of Beshr the Barefoot brought him a loaf, the earnings of her spindle. The day when he came out of prison, the forty loaves remained intact, not one having been eaten. When Beshrâ€™s sister heard of this, she became very sad. â€œYou know that those loaves were lawful food and unsolicited. Why did you not eat them?â€� she protested. â€œBecause the plate was not clean,â€� Dhul-Nun al-Misri replied, meaning that it had been handled by the gaoler. As Dhul-Nun al-Misri came out of the prison he stumbled and cut his forehead. It is related that much blood flowed, but not one drop fell on his face, his hair or his clothes, and all the blood that fell on the ground vanished at once, by the command of Almighty God. Then they brought him before the caliph, and he was ordered to answer the charges preferred against him. He explained his doctrine in such a manner that Motawakkel burst into tears, and all his ministers stood in wonder at his eloquence. So the caliph became his disciple, and accorded him high honour. When Rahula, Buddha's son, was seven, he set out some water for his father to wash his feet. Buddha picked up a ladle full of the water and began to wash. He showed his son the ladle with a little bit of water left in it and said "This is how little worth is left in someone who isn't ashamed at telling a lie." Tossing away the little bit of water, he said "What little honor is left in someone who is not ashamed when telling a lie is tossed away just like that." Turning the ladle upside down, he said "What little honor there is in someone who is not ashamed is turned upside down just like that." And showing Rahula the empty ladle, he said "What little honor there is in someone who is not ashamed is empty and hollow just like that." "A royal elephant going into battle who holds back in the fight hasn't given of himself fully. But when he gives his all, there is nothing he will not do. The same thing is true of someone who is not ashamed when they tell a lie: There is no evil he will not do! So train yourself not to lie, even in jest. "What do your think a mirror is for?" "Just like a mirror, you actions, whether they are physical, verbal, or mental, should be done with constant reflectiion. "When you are considering doing something, reflect on it: Is this something which will cause harm to myself or others? If so, stop yourself from doing it. If not, if it leads to happy consequences, you may feel free to do it. While you are doing something, reflect on it: Is this act harming anyone? If so, stop. If not, go ahead. After you have done something, reflect on what you have done. If it resulted in harm to yourself or others, confess it to your teacher or companions, and resolve to restrain yourself in the future. If the act had happy consequences, then be joyful. "The same things apply to verbal acts. Before, during, and after you say something, reflect on it. If it seems that your speech will have or does have negative consequences, then restrain yourself or, if you are too late, confess and resolve to do better in the future. If what you have to say has positive consequences, then go ahead. "And the same thing applies to mental acts. Reflect on them, before, during, and after. If a thought has negative consequences, abandon it or, if it is too late, be ashamed and resolve to improve. If the thought has positive qualities, then act upon it. "Before, during, and after, reflect on your behavior, and purify yourself this way." Liberally paraphrased from That the True Dhamma Might Last a Long Time: Readings Selected by King Asoka, translated by Thanissaro Bhikkhu (www.accesstoinsight.org). Wonderful teachings of Lord Buddha.These are favourites of Master TGN who never tires of quoting these-so simple and fundamental. Yes,it is indeed beautiful,simple and very practical wisdom too. And all told through a nice stories. 'Solomon, in the midst of all his occupations, passed by a swarm of ants on the roadside.All the ants came forward to do obeisance; in an hour many thousands had come. But one ant did not come quickly before him because there was a mound of earth in front of its home.With the speed of the wind that ant was carrying out each separate particle of earth so that that mound might be cleared away. Solomon summoned it and said: "0 ant, I perceive thee to be without strength or endurance,And yet if thou wert to acquire the lifes pan of Noah and the patience of Job,thy task would not be accomplished.This is no task for the arm of thy likes; thou wilt not cause this mound to disappear." The ant opened its mouth and said: "0 king, by high endeavour one can proceed along this road. Look not at my constitution and build, have regard to the perfection of my endeavour.There is a certain she-ant who is invisible to me and who had drawn me into the snare other love. She has said to me: 'If thou removest this mound of earth from here and clearest the way,I will cast on one side the boulder of separation from thee and then sit together with thee. 'Now my loins are girded for this task; I know about nothing except this carrying of earth. Friend, learn of love from an ant; learn of such sight from one who is blind.Though the ant's cloak is very black, yet it is one of the attendants on the road. Nushirvan was riding his horse with the speed of an arrow when he saw in the road an old man [bent] like a bow. The old man was planting a number of trees. The king said to him: "Sincethy hair has turned to milk,And since thou wilt remain only a few more days, why art thou planting trees here?" The old man replied: "There is reason enough. Since many have planted for us,So that today we have the benefit thereof, we too are planting for others. One should take each step in accordance with one's capacity, for in every step there should be order. The king was pleased with the old man's speech. He filled his hand with gold and said: "Take this." The old man said to him: "0 victorious king, already today my trees have borne fruit. For If I live to be over seventy thou knowest that I have not fared badly by this planting. The planting did not make me wait ten years; it has borne gold as fruit this very day." Thou must perform thy labour today for without labour thou wilt have no fruit. Thou must set thy foot on the road of the Faith, thou must lay aside vanity. Many hundreds of years ago there were two man of Kabul who fell upon very hard times. They lost all they owned and suffered great hardship and poverty. So great was their misfortune that, try as they might, they could not improve their position. Always something happened to them to cause them a setback. Great were the bodily hunger and distress of mind, which they suffered. Grief and sorrow lay upon them like a heavy cloud. One day one man said to the other: â€˜We have suffered much and have toiled hard, yet there seems no hope of improving our lot. Let us leave this country and seek our fortune elsewhere. Surely that would be a wise move. The good sultan Mahmud is now reigning, and he is well known for his generosity. Let us go to Ghazna and try to see him. Then at least it will give us some hope that our miserable circumstances may be alteredâ€™. So they set out for Ghazna and on the road they met a man who joined their company and walked with them. He was a very pious man and he seemed happy and contented; indeed it was as if he walked the earth like one of the blessed. â€œWe have both suffered great and prolonged misfortune and have endured great hardshipâ€�, the two men replied. â€œIn Kabul we have toiled hard and long and have yet failed to improve our lot, and having heard of the great generosity of sultan Mahmud and his concern for the poor and needy we have decided to make our way to him in the hope that he will look kindly upon us and help us back on the road of prosperityâ€�. The two men of Kabul then asked the stranger whither he was bound and what the object of his journey was. â€œI, too, have nothing I can call my own in my country and my affairs too are going badlyâ€�, he replied. â€œI go in search of some lawful means of support, but I do not expect anything from sultan Mahmud or anyone like him. Sultan Mahmud and his kind are besieged by a hundred thousand men all hoping that he in his infinite grace and bounty will bestow some gift or favour upon them. I shall look elsewhere for a solution to my difficultiesâ€�. The three men continued their journey in company and when at length they arrived in Ghazna they took up their lodging together in a ruined building. One night the three men were sitting together in the ruin talking of this and that, and it so happened that at this time sultan Mahmud had left his palace with two close friends to take a walk in the moonlight. As they approached the ruin the sultan was attracted by the sound of voices; he walked on, discovered the three travellers and asked them who they were. The two men of Kabul replied: â€œWe have been crushed in the press of poverty and misfortune and are now distressed and helpless. We left our own country to seek some betterment of our lot elsewhere. Fate has led us hither and we hope that somehow, somewhere, the cloud of misery which envelops us will be liftedâ€�. â€œAnd what are your wishes?â€� inquired the sultan. And the sultan said: â€œIt is the duty of men to help each other. Therefore, tell me your desires that I at least may know how you could be helpedâ€�. The first man replied: â€œI was once prosperous and had great wealth. This world, with its chances and changes, ceased to be lucky for me, and the shame of my poverty and the disgrace of my family have caused me to leave my country. Now, if I had ten thousand dinars I could regard the sum as fresh capital and could then raise my head again and return to my countryâ€�. The second man replied: â€œI had a dutiful and loving wife. The loveliness of her features surpassed the rose in beauty; the radiance of her face made the moon seem to decline in splendour. I loved her much and could not bear to be parted from her. But she died and I was so consumed with grief that I felt lost and helpless. If his highness the sultan were to present me with a member of his harem so that my life might once more be lighted by the sun of her presence, I would gladly return to my own countryâ€�. â€œI place all my trust in God. I need neither a wife nor gold. I turn my face towards the mercy of God by Whom all favours are granted. All our desires are known to God and God knows what we deserve. I place myself in His hands; He will grant whatever is right for me. All I ask of you is this: if you enjoy the favour of God and if He grants you your desires, please pray to Him for my sake that I may never follow a line of thought or action which is against His willâ€�. The sultan said no more and, without letting it be known who he was, rose and departed. Next morning he ordered that the three strangers whom he had met in the ruin be brought to his presence. â€œBegging leaves a bitter taste in the mouth. 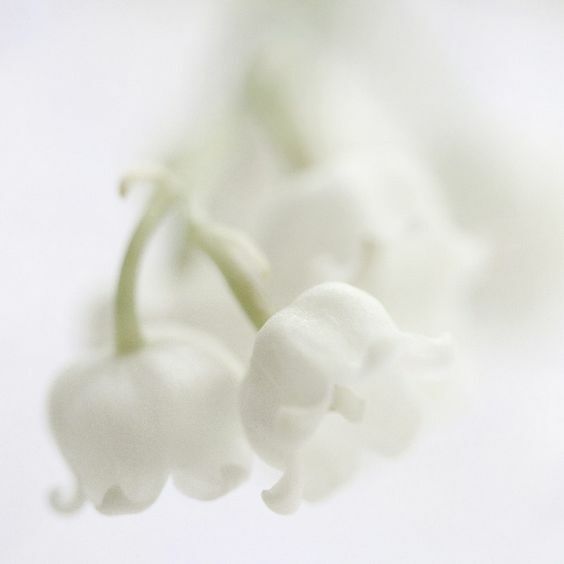 Sweet is the generosity of the noble-minded. O most kind of the rulers, may the treasury of your desires remain filled with the gold, silver and jewels of prosperity so long as the storehouse of God is full of blessings. Although many rejoice in your bounty and you yourself know the sweet taste of good deeds, those who have found their peace with God are so contented that they have no desire to take anything from another man. Contentment is not sweetened by the generosity of others and the delights of independence are far greater than any pleasure there may be in receiving gifts from others. I submit my hopes and longings only to God; He will grant what is right and good for me. I have no need to ask another man for anythingâ€�. Now the sultan, who was not used to meeting such independence, tried to persuade the man to ask for some gift or favour, but the man could not be shaken from his avowed principles. The sultan then gave orders that the man who wanted a wife should be given one of the sultanâ€™s own damsels, while the man who wanted money was presented with two purses of gold. He then commanded that all three men should return to their own countries. The three men accordingly set out on the road back to Kabul. When the companions had walked about seven miles the man who had been given the gold began to feel tired from the weight of it so he handed it to his empty-handed friend, requesting him to carry it until he had rested a while. After the three men had left the presence of the sultan, the ruler turned to his courtiers and said: â€œThat independent man has put me greatly to shame. Although I tried to persuade him to accept a gift of some kind he would take nothing and when he left me I felt as if I was in the position of a poor manâ€�. Now one of the courtiers was a very greedy man, and greedy men are the natural enemies of the contented. â€œThe sultans and kings of this worldâ€� â€“ said the greedy courtier â€“ â€œare Godâ€™s treasurers. Men who will not turn to their rulers for help or scorn their favours are guilty of the sin of pride and act contrary to the will of God. Such men deserve to die and should be punishedâ€�. Lord Vithal, or Panduranga Vittala, is an incarnation of Lord Vishnu and is worshipped in the world famous Pandarpur Rukmini Vithal Temple at Pandarpur in Maharashtra. There is an interesting story that explains about the incarnation of Lord Vithal at Pandarpur. Once a devotee named Pundalik was traveling to Kashi and reached the Ashram of Saint Kukkut. He asked the sage the way to Kashi. Kukkut Rishi said that he did not know the way to Kashi and he had never been there. Pundalik made fun of Kukkut Rishi for not knowing the way to Kashi and said that a holy man like him should have already visited Kashi. Kukkut Rishi kept quiet and did not bother to answer Pundalik. During the course of the night Pundalik heard the voice of women in the ashram. He came to out to look what was happening and saw that three women were sprinkling water on the Ashram and cleaning it. On enquiry, Pundalik found out that the three women were Ganga, Yamuna and Saraswathi and they had come to clean the Ashram of Kukkut Rishi. Pundalik wondered how a saint like Kukkut who had not visited Kashi was such holy and powerful that the three holy rivers came down to purify his ashram. The three women told Pundalik that piety, spirituality and devotion does not depend on visiting holy places or doing costly rituals but in performing one?s karma. The three women told him that Sage Kukkut had served and nursed his parents most faithfully and devoted all his life to that one aim. He had thus accumulated Punya enough to earn Moksha and bring us down to earth to serve him. Pundalik had left is old parents at home and was visiting Kashi to gain moksha and blessing. He did not bother to entertain the request of his parents to take them also to Kashi. Pundalik now understood his mistake and rushed back home and took his parents to Kashi and on return started looking after them. From then onwards the care of his old mother and father came before everything else. Lord Krishna was moved by the sincere devotion of Pundalik towards his parents. He decided to visit Pundalik?s home. When Lord Krishna visited Pundalik?s home he was serving food to his old parents. 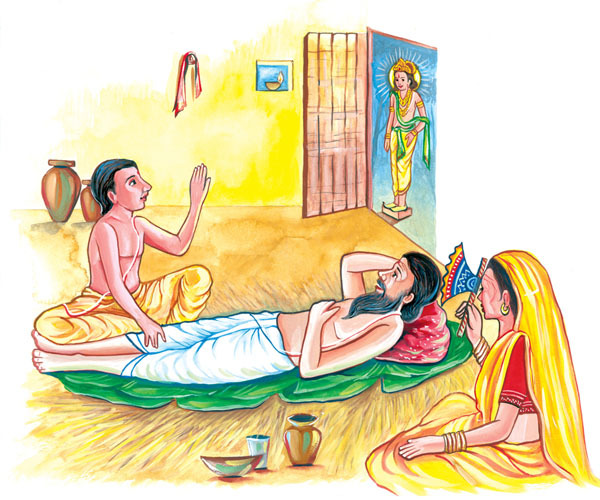 Pundalik saw the Lord at his door but his devotion to his parents was so intense that he wanted to finish his duties first and then attend to his guest. Pundalik had reached such a stage that it didn?t matter to him whether the guest was a mere mortal or God. All that mattered was service to his parents. Pundalik gave Lord Krishna a brick to stand on and asked Him to wait until his duty was completed. Lord Krishna was moved by the devotion of Pundalik to his parents and waited for him patiently. Later when Pundalik came out he asked the Lord forgiveness for making Him wait. Lord Krishna blessed him and asked him to ask a boon. Pundalik said what more can I ask when the Lord himself waits for me. When Lord Krishna insisted that he ask a boon, Pundalik asked that the Lord should remain on earth and bless and take care of His devotees. Lord Krishna agreed to stay there and is known as Vithoba or the Lord who stands on a brick. This form of the Lord Vithoba is Swayambhu which means that His idol has not been carved or etched but it came into existence on its own. What a wonderful story!Thanks very much. RAM: "Sir, we are quite happy. But when she comes the family is broken up. If such is the case-"
MASTER: "Then build them a separate home. That will be a different thing. You will defray their monthly expenses. How worthy of worship one's parents are! Rakhal asked me if he could take the food left on his father's plate. 'What do you mean?' I said. 'What have you become that you cannot?' But it is also true that good people won't give anyone, even a dog, the food from their plates." (To M., reproachfully) "And let me say this to you. Your father and mother brought you up. You yourself are the father of several children. Yet you have left home with your wife. You have cheated your parents. You have come away with your wife and children, and you feel you have become a holy man. Your father doesn't need any money from you; otherwise I should have cried, 'Shame on you!'" The Master was still in the ecstatic mood. Suddenly he said to M: "Look here, you have had enough of reasoning. No more of it. Promise that you won't reason any more." M. (with folded hands): "Yes, sir. I won't." MASTER: "You have had enough of it. When you came to me the first time, I told you your spiritual Ideal. I know everything about you, do I not?" M. (with folded hands): "Yes, sir." MASTER: "Yes, I know everything: what your Ideal is, who you are, your inside and outside, the events of your past lives, and your future. Do I not?" MASTER: "I scolded you on learning that you had a son. Now go home and live there. Let them know that you belong to them. But you must remember in your heart of hearts that you do not belong to them nor they to you." M. sat in silence. The Master went on instructing him. MASTER: "You have now learnt to fly. But keep your loving relationship with your father. Can't you prostrate yourself before him?" M. (with folded hands): "Yes, sir. I can." MASTER: "What more shall I say to you? You, know everything. You understand, don't you?" M. sat there without uttering a word. MASTER: "You have understood, haven't you?" M: "Yes, sir, I now understand a little." MASTER: "No, you understand a great deal. Rakhal's father is pleased about his staying here." M. remained with folded hands. MASTER: "Yes, what you are thinking will also come to pass." One book(It is not just a Book!) I invariably recommend over and over again is this-The Gospel of Sri Ramakrishna.It addresses almost all circumstances and doubts that an aspirant can possibly encounter and gives definitive course of action.Truly indispensable for all aspirants.